A 1960 AASHO (now AASHTO) document — "An Informational Guide on Project Procedures" — contains specific language that serves as the basis for the de facto policy. It is cited specifically in section 1 of the 1981 Policy. Click here to view/download a copy of the 1960 document (pictured at right). 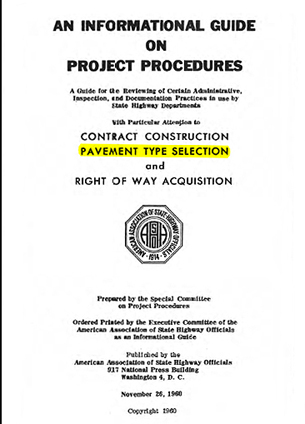 The current Federal policy on pavement type-selection may be viewed in as the original public notices, Pavement Type Selection (23CFR, Ch I), published in October 8, 1981. Click here to view/download a copy. The current Federal policy also included a clarification and supplementary information published on November 9, 1981. Click here to view/download a copy. In 2008, the Federal Highway Administration published a memorandum to provide specific guidance on alternate bidding. Click here to view/download a copy.